In the work the results of researches on laser and plasma synthesis of compounds on the basis of aluminum, as well as on modifying and processing by means of laser and plasma beams of aluminum ligatures and alloys are presented. Possibility of perspective application of laser and plasma technologies in processes of synthesis and modifying of these alloys and ligatures is shown. Key words: Aluminum alloys, ligature, plasma processing, laser processing, microstructure, microhardness. Causes of higher wear of quartzite lining of mains frequency crucible induction furnace (IChT)when melting irons are discussed. Visually presented are cases of wear that were found during the examination of the lining being knocked out. Recommendations on preventing them are given. Key words: Mains frequency induction furnace, quartzite, lining and its wear. Principles of alloying to make nanostructured (NS) wrought conducting Al alloys are substantiated. Such alloys are based on triplex systems Al-Mg-Si, Al-Mn-Cu. They are analyzed to determine the influence of various elements Zr, Co, W, Ni, Zn, Ca and others on electroconductivity and strength. Key words: aluminum, additives, electroconductivity, strength, nanostructured alloy, quasibinary systems. Is shown, that the application vibration of absorbing constructional materials, i.e. alloys high damping, is the most effective way of decrease (reduction) of noise and vibration of the metallurgical equipment. In this connection the results of development of technology genetic engineering for reception of alloys of system Al–Mg–Zn with improved acoustic damping and mechanical properties are given. Key words: aluminium alloys, acoustic and mechanical properties, gadolinium, itterbium, zinc, magnesium, genetic engineering in alloys. Described is the technology of making synthetic irons of various functional purposes in induction furnaces using complex metallurgical mixes of UKKS CSiC materials in foundries of the metallurgical and machine-building complexes. Key words: CSiC mixes, carbon-silicon carbide mix, silicon carbide, synthetic iron. 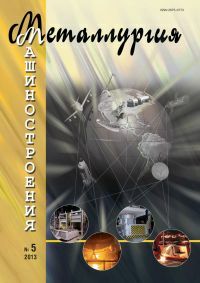 The article describes Ukrainian scientists technical solutions that are examples of ways to strip casting and basic design of the roll evacuated mold. As a new factor for regulating the parameters of casting and quality of the cast strip stabilization requested vacuum roll. Key words: Casting, strip, roll, mold, vacuum. The composition, properties, applicability and production methods of Fe-TiC composites are reviewed. A new method of Fe-TiC composites productionby selfpropagating high temperature synthesis (SHS) developed and proposed for the commercial introduction. Key words: Fe-TiC composite, self-propagating high temperature synthesis, SHS, thermite, in situ TiC, granulating, aluminothermic reduction. Modern methods of making alumomatrix composite alloys (ACA) are analyzed. The main problems occurring when making ACA by liquid-phase methods are outlined. Fields of and outlooks for ACA application in the automobile industry are shown. Key words: Alumomatrix composite alloys, liquid-phase production methods, outlooks for application in automobile industry. In work it is shown, that depending on parameters of treatment of melts, it is possible effectively to operate modes of heat treatment of cast products from silumins with providing guaranteed high level of properties. On the basis of the analysis of experimental results the theoretical substantiation confirming possibility of reduction of hold time at heat treatment of castings is given. Key words: Silumins, parameters of cast structure, modifier, size of phase components of cast structure, heat treatment, speed of dissolution of a phase, ultimate strength, hardness. The article discusses the structural defects that appear on the single-crystal blanks seed of nickel-tungsten alloy produced in installations of directional solidification. The causes of defects and their solutions. Key words: Single crystals of superalloys, directional solidification equipment, seed, recrystallization. Studied was the possibility of combining the processes of casting and punching to obtain a fine-grain equiaxial metal structure in castings. It was experimentally proven that it is possible even at a minimal number of treatment cycles. Key words: Casting, punching, half-matrix, fine-grain structure. The possibility of wasteless processing of aluminium slacs. Presents data on the composition of the toxins and products of their processing. Shows the perspective directions of use of the products of processing of aluminium slacs. Key words: Aluminium slag, flux, modification of aluminium alloys, investment casting.